At the foot of Clifton Hill just after you enter Queen Victoria Park you’ll see a large circular pond found inside large blocks of concrete. The pond is surrounded by a walkway and in the warmer month’s colourful flowers. 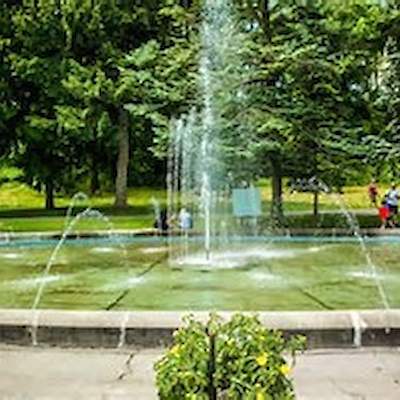 This pond, built in 1856, is called the Zimmerman,” Fountain Pond”. It is the last remnant of the Samuel Zimmerman Estate. Zimmerman, the founder of Niagara Falls, at that time owned half of the land in Queen Victoria Park lying between Clifton Hill and Murray Hill. He had the area laid out in walks and ornamental gardens. Look carefully and you can still see a piece of flat land that was once a double tennis court. It’s just beyond the fountain pond. During the summer, you’ll see the fountain pond lit up with beautifully coloured lights located below the water level. 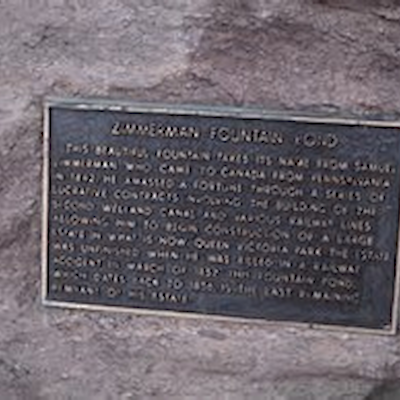 Google, “Zimmerman Fountain Pond” for more information.